Your bluebird friends receive a beautiful home, while you enjoy a charming outdoor accent with the Heartwood Songbird Suite. 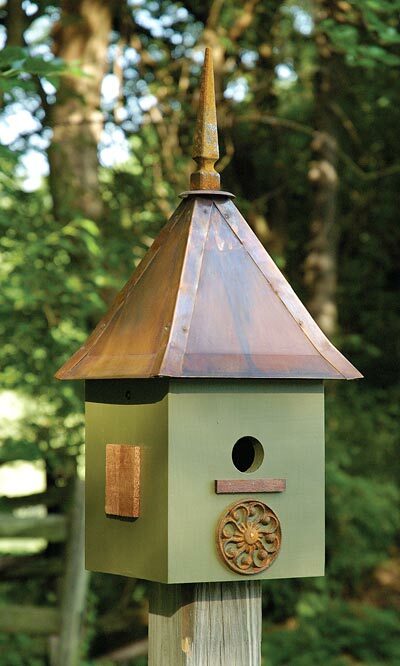 The house is made of solid cypress, painted dark olive, and topped with a solid copper roof. Mahogany shutters decorate the sides of the suite, a mahogany perch rests just under the 1.5" diameter entrance hole, and a filigree circle adds special interest to the front of the house. A cast iron pointed spire provides the finishing touch of this beautiful home. Proper drainage and ventilation ensure that the resident birds stay healthy and comfortable, and the removable roof allows for convenient cleaning and observation. An extra copper disc on the back of the house unscrews for even more cleanout options. Use the included mounting bracket and screws to attach the house to a post. Let the Songbird Suite please you and your neighborhood bluebirds. Made in the USA.